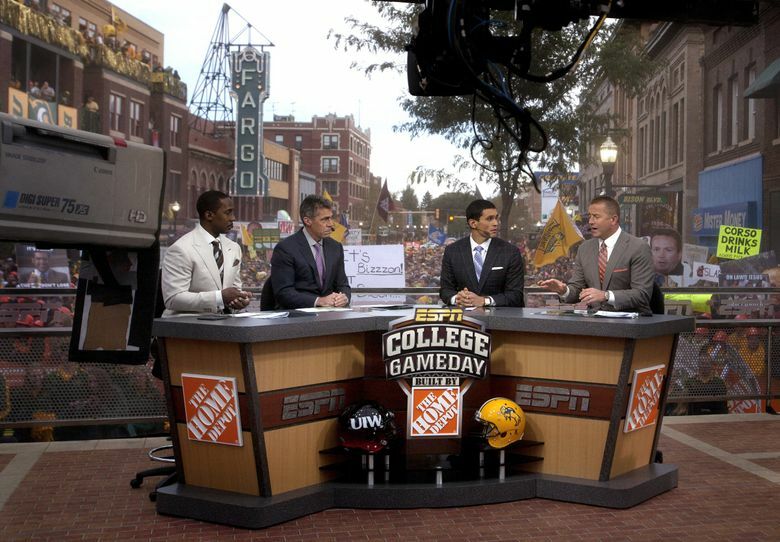 Week after week, the WSU flag waved behind the set, with the goal soon becoming to get the ESPN show to come to Pullman. On Saturday, that will happen for the first time. 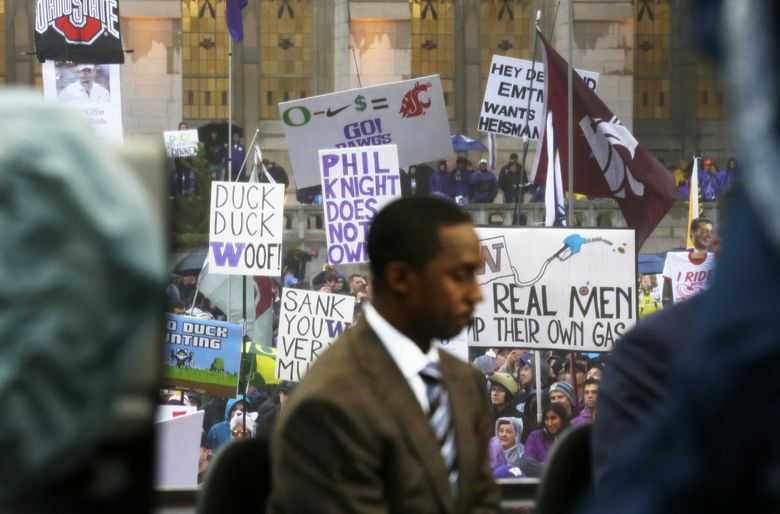 PULLMAN — Fifteen years ago, when Tom Pounds drove 700 miles from his home in Albuquerque, N.M., to Austin, Texas, to show off his homemade Washington State University flag behind the set of ESPN’s “College GameDay,” he had no idea what a tradition it would become. “It was purely school spirit — a Coug thing,” Pounds said this week. It became so much more. Week after week, the WSU flag waved behind the set, with the goal soon becoming to get the show to come to Pullman. On Saturday, that will happen for the first time. Pounds is making the trip up to wave the flag. “After a couple of years, I realized it had become so big that I couldn’t stop it even if I wanted to,” Pounds said. That’s pretty amazing considering the humble beginnings. A couple of weeks after Pounds took the flag to Austin in September 2003, he got a call from Brent Schwartz in Minnesota. Schwartz wanted to wave the flag in Madison, Wisc., on Oct, 18, 2003. Pounds sent the flag to Schwartz, who drove 300 miles to wave the flag. The flag has been a constant since, with this Saturday marking 217 straight games. “There were a lot of times early on where I had to sweat it out,” Pounds said of finding people to wave the flag wherever ESPN decided to broadcast each week. Pounds paid for shipping early on, then formed the Ol’ Crimson Booster Club to help finance and coordinate the operation. The streak could have ended several times the first couple of years, but Andrew Pannek, a Delta Air Lines employee who could fly for free, took red-eye flights with the flag and kept it going, waving the flag at 10 straight shows. In 2010, Pounds said, his upcoming wedding forced him to pass on club leadership to someone else. “That was the year I met C.J. McCoy, and I just knew he was the guy,” said Pounds, who got a degree in electrical engineering from WSU in 1981 and is a high-school science teacher in Albuquerque. McCoy, a 1998 WSU graduate and an assistant vice president in the office of Economic Engagement at Lehigh University who is currently serving a fellowship at George Mason University in Fairfax, Va., is still leading the way, and finally after all these years, the flag will wave in Pullman. The “GameDay” crew is looking forward to coming to Pullman. Rece Davis, host of “GameDay” since 2015, was the play-by-play announcer during Washington State’s 55-21 loss to Arizona State on Halloween night in 2013. “I’ve experienced a little taste of what Pullman has to offer, and I have a feeling that Halloween night in Pullman — which is a sight to see in and of itself — I think it’s going to pale in comparison to what we have on Saturday,” Davis said. Washington State coach Mike Leach has good memories of “GameDay.” He was coaching Texas Tech when the show made its first appearance in Lubbock, and Leach’s Red Raiders defeated No. 1 Texas 39-33. Leach, who normally hates distractions, says he’s happy the show is coming to Pullman. Davis said coming to Pullman means more to him because of the flag tradition. Oh, how things have changed in 15 years. No longer is it hard to find people to wave the flag. McCoy has plenty of volunteers around the country. And now, even with “GameDay” finally coming to Pullman, McCoy said the tradition will continue. Washington State is the 70th different school to host “College GameDay,” and Pullman is the 82nd different city to host “GameDay.” There have been 354 shows. If analyst Lee Corso picks Washington State, it will be the 57th different mascot head he has donned at the end of the show.